EID MUBARAK TO ALL MY MUSLIM FRIENDS !!!!!!!!! Biryani is a muslim recipe earlier but now it is favourite to everyone. Biryani’s are always special to me and I am a big mushroom lover too. So I made this Mushroom Biryani, also called kalan biryani in tamil. In this biryani recipe, I have used button mushroom, you can use any variety of mushroom. 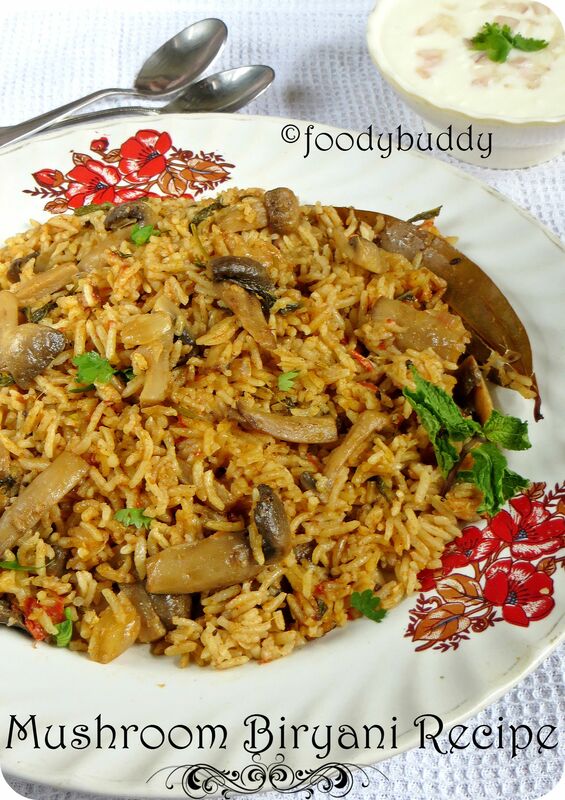 This mushroom biryani recipe is very easy to make one pot meal, yummy in flavour and delicious in taste. 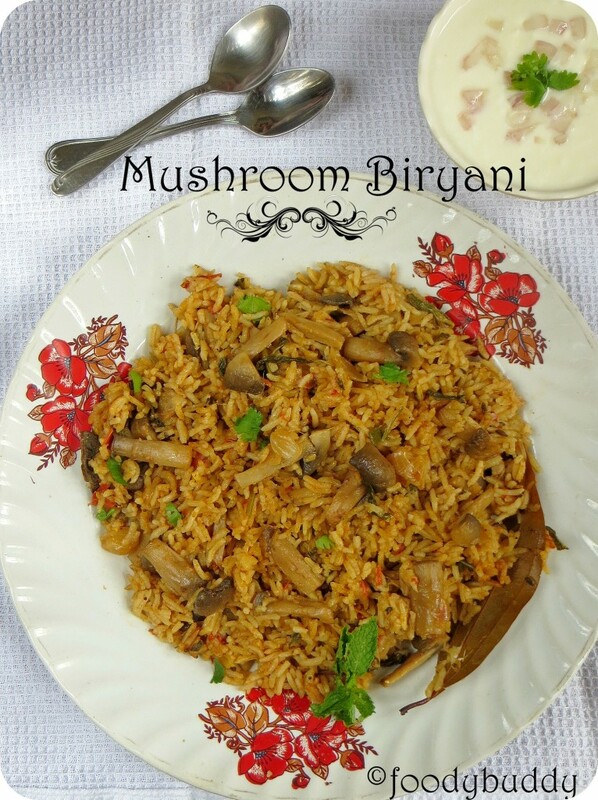 You can make dum biryani with mushroom, since it takes a lot of time, I made this mushroom biryani in pressure cooker..This flavorful and easy mushroom biryani goes well with onion raita or zucchini raita or cucumber raita. Let us learn how to make mushroom biryani in a simpler way. Also check my other mushroom recipes in my blog : Mushroom manchurian, soya chunks mushroom curry, mushroom, cucumber and tomato sandwich, stir fried asparagus with mushroom, vegetarian sandwich with soya crumbles and mushroom, portabella mushroom burger, cream of mushroom soup, quick mushroom rice, black eyed peas with mushroom, sippy kalaan kurma, beans mushroom fry, mushroom spinach gravy, mushroom 65. Soak the rice in water for 15 mins. Drain the water. In a pan, add little ghee and roast the rice for few mins and keep it aside. Wash and chop the mushroom into pieces. Slit the green chilly and chop the tomatoes. In a mixie, first grind all the ingredients listed under ” To Grind – 1 ” and keep it aside. Secondly, grind the onion and keep it aside. In a pressure cooker, add ghee and oil, when it is hot, add ground masala paste, bay leaf, fry this for a minute. Add ginger garlic paste, green chilly and ground onion paste, fry this until raw smell vanishes. Add mint leaves, coriander leaves and chopped tomatoes, sauté this until it turns soft and mushy. Add coriander and red chilly powder mix and garam masala. Fry well. Add curd and mushroom, sauté for few mins. Add rice, mix well with masala, add salt and water. Pressure cook for 2 whistles. After pressure releases, fluff the rice with a fork. Do not break the rice while mixing. Hot Mushroom rice is ready to serve hot with cucumber raita or zucchini raita. You can use any variety of mushroom to make this dish. Adjust the spicy taste according to your taste. Use basmati rice to make biryani, it adds a nice flavor to dish. Always soak the rice before use. You can also squeeze some lemon juice at the end after biryani is done. You can use coconut milk instead of water. Do not break the rice while mixing, as it should be separate and fluffy. Don’t add turmeric powder for biryani.